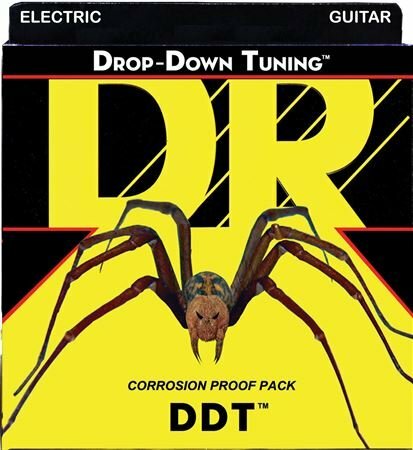 Shop DR Strings DDT Drop Down Tuning Electric Guitar Strings from AMS and enjoy Fast & Free Shipping. The first thing you will notice about the DDT Drop Down Tuning strings is how stable they are and how they go right into tune and lock in. Players say "they are so stable it is almost eerie." Now, you can stand and deliver in tune notes at lower pitch that are clean and clear. Expect more and get more! Change tunings and be surprised how the DDT strings lock in. Be surprised how little adjustments you make. DDT strings deliver far more than just heavy gauges. Drop tune with confidence. Drop tune with accuracy. DDT strings maintain their intonation at lower tunings far better than any other string we have everplayed or heard. Designed and wound to answer the needs of the dark side. Great strings, as the name implies they are great for drop tuning, keep my electrics in D standard and drop down to C for a lot of songs. Good strings for drop C tuning etc. I use these on my lower tuned guitars. My doom axes. haha C standard etc.. They hold tune well, last a week a set when we are jamming every night. Overall reliable and gnarly sounding strings. Really awesome strings, I go between drop-D and E-Standard and they work great in both tunings. Very articulate strings that last long and have superb stability, what more could you want! Great strings, they go into tune with very little stretching. Not as long lasting as I would like.